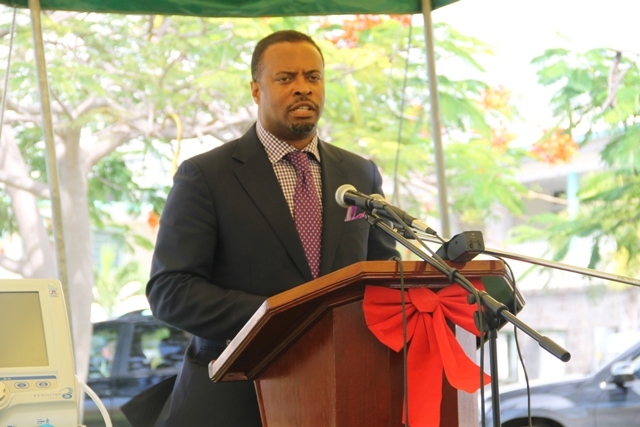 NIA CHARLESTOWN NEVIS (December 22, 2014) — Deputy Premier and Minister of Health on Nevis Hon. Mark Brantley, thanked the St. Christopher and Nevis Social Security Board for a donation to the Ministry of Health for the Alexandra Hospital. He described it as a Christmas gift to the people of Nevis. Mr. Brantley made the comment as he received the gifts from Prime Minister and Minister for Social Security the Rt. Hon. Dr. Denzil Douglas. 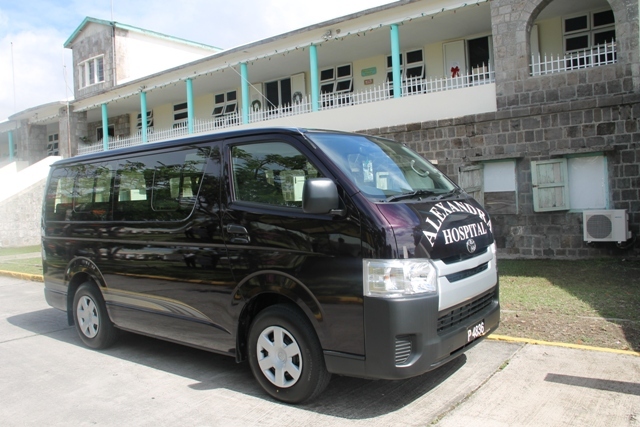 The handing over ceremony was held at the Alexandra Hospital’s grounds on December 19, 2014. “This gift I see as a Christmas gift to the people of Nevis. It is a valuable gift, not just in the dollar value… even more importantly, the two pieces of machinery – the ventilator that is here and the anaesthesia monitor that is to come. “The ventilator is important because, I am told, it is a ventilator that can also be used for paediatrics and that means, that for the very first time at our hospital, we have such a ventilator and for me is real progress. A real opportunity for us here in the health care sector in Nevis,” he said. 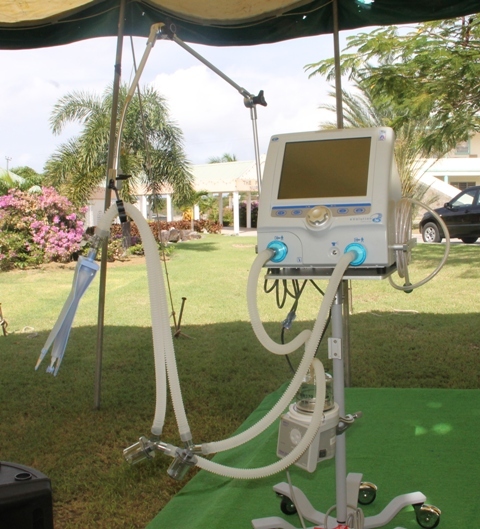 According to Mr. Brantley, the ventilator would complement other ventilators at the Hospital among them a brand new ventilator which was recently purchased by the Nevis Island Administration and commissioned. He noted that the pool of equipment at the Alexandra Hospital had greatly improved. “I believe…the equipment available at the hospital here has really improved tremendously and these are ventilators that we hope…they will never be pressed into use but if the need arises, at least our staff here, our dedicated and professional staff, are equipped to handle it and to handle it in any emergency that might arise,” he said. The Health Minister urged persons to pay their Social Security contributions which he reminded, would ensure the Board’s continued assistance to the people of Nevis. Meantime, Director of Social Security Mrs. Sephlin Lawrence, explained their most recent gift to the people of Nevis, through the Ministry of Health, was not the first. “We have made numerous donations to the Ministry of Health in Nevis spanning several years. 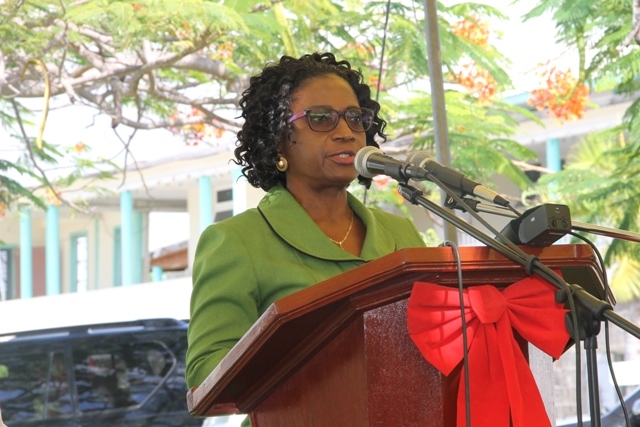 Each year, we allocate the amount of $80,000 to the Nevis Ministry and they have succeeded in enhancing the health care they offer in Nevis,” she said. Lawrence stated that the donation was valued at $188,903. The gift consisted of a patient monitor, a ventilator and a Toyota bus. She said although the sum exceeded the annual amount, the Ministry had accumulated it so the Board could purchase those items. “Social Security acknowledges the commitment of many employers who have consistently made their contribution on time. There are others who also make the effort despite financial challenges in their business. We appreciate their effort. “Our 10 percent increase in contributions in 2014 to date, is attributable to improved business in the economy. Nevis contributed 24 percent of that and it is those contributions, coupled with income from investments which allow Social Security to be this generous. We encourage the people of Nevis to continue to pay,” she said. Medical Chief of Staff at the Alexandra Hospital Dr. John Essien, in brief remarks stated that the pieces of equipment were essential to the health facility. “Our prime objective as health givers is to make sure our patients, when they come into our institution, to leave here in the best possible conditions and the anaesthesia monitor and this ventilator, are pieces of equipment which we definitely know will help in providing adequate care to our patients. “They are very critical. They will be used on the critically ill patents and the patients in the operating room area of the hospital. This is a top of the line ventilator for the 21st century, a touch screen product and it works for all ages. So it’s a big step in terms of the quality of the service we are able to provide. Once again, we thank the Social Security Board and continue to encourage our people to remain healthy, so that their contributions will also help to bring the sick to good health,” he said.